The Santoku knife from the house of Miyabi has a sharpness of approximately 63 Rockwell and is suitable for cutting meat, fish and vegetables. The dark wooden handle is comfortable to hold thanks to its ergonomic shape, and allows effortless progress. The blade’s pattern, cutting properties, durability and toughness are impressive. The material used allows fast cleaning in the dishwasher. The manufacturer has paid attention to an authentic Japanese blade profile, which is decorated with a hammered look. The core of the blade is made of micro carbide, wrapped with two layers of steel. Double-sided grinding and the Honbazuke edge of the blade perfects the sharpness of the 18 cm Miyabi Santoku knife. The handle is made of tough dark cocobolo pakka wood. A goose neck curved handle allows easy working. There is also an individual counterbalance within the handle, so you can cut easily without exerting much force. 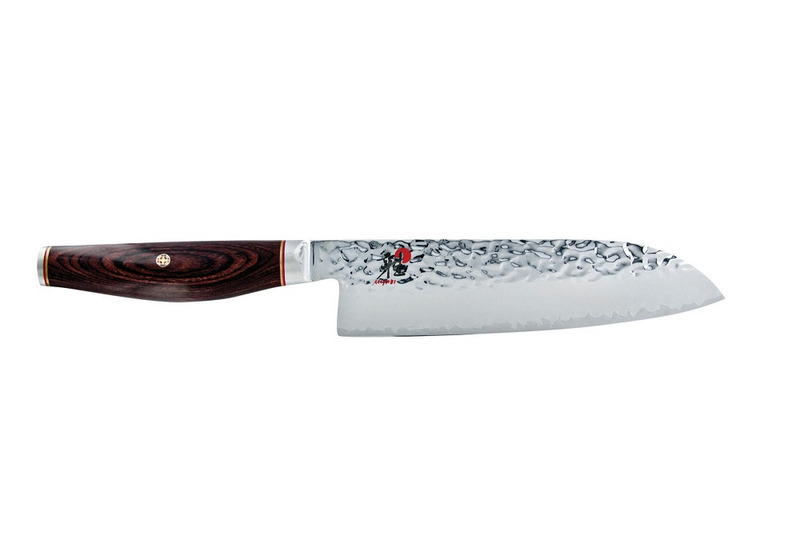 The Santoku knife from the MIYABI 6000MCT range ensures fast, clean, precise cutting. This product delivers high quality with Japanese design and you will use it often.